// Define the visualization parameters. // Center the map and display the image. In this example, band ‘B5’ is assigned to red, ‘B4’ is assigned to green, and ‘B3’ is assigned to blue. The result should look something like Figure 1. Figure 1. 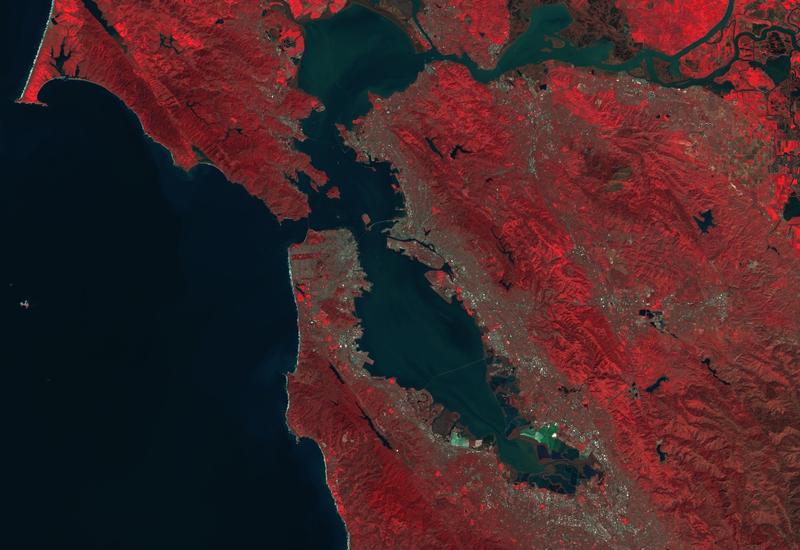 Landsat 8 false color composite of San Francisco bay area, California, USA. // Create an NDWI image, define visualization parameters and display. In this example, note that the min and max parameters indicate the range of pixel values to which the palette should be applied. Intermediate values are linearly stretched. Also note that the opt_show parameter is set to false. This results in the visibility of the layer being off when it is added to the map. It can always be turned on again using the Layer Manager in the upper right corner of the map. The result should look something like Figure 2. Figure 2. 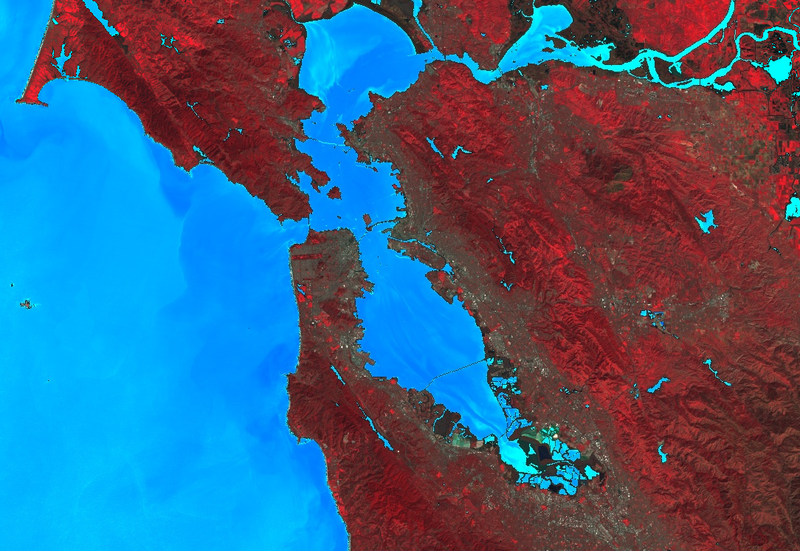 Landsat 8 NDWI, San Francisco bay area, USA. Same area as Figure 1. Cyan are low values, blue are high values. // Mask the non-watery parts of the image, where NDWI < 0.4. // Mosaic the visualization layers and display (or export). In this example, observe that a list of the two visualization images is provided to the ImageCollection constructor. The order of the list determines the order in which the images are rendered on the map. The result should look something like Figure 3. Figure 3. Mosaic of a Landsat 8 false color composite and NDWI. San Francisco bay area, USA. 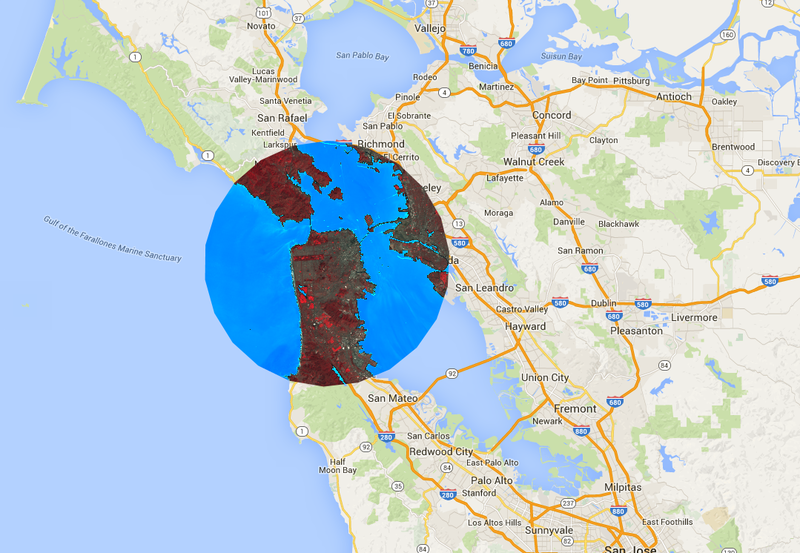 // Create a circle by drawing a 20000 meter buffer around a point. // Display a clipped version of the mosaic. In the previous example, note that the coordinates are provided to the Geometry constructor and the buffer length is specified as 20,000 meters. Learn more about geometries on the Geometries page. The result, shown with the map in the background, should look something like Figure 4. Figure 4. 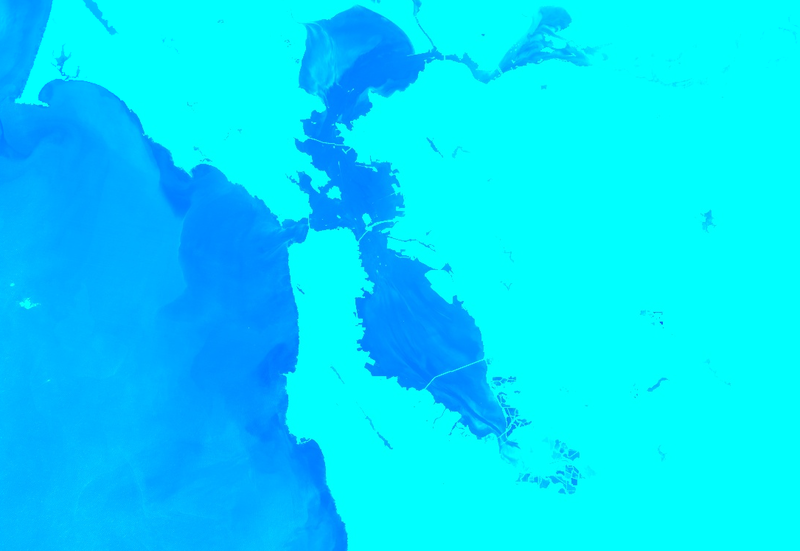 The mosaic shown in Figure 4, clipped to a buffer around San Francisco, California, USA. 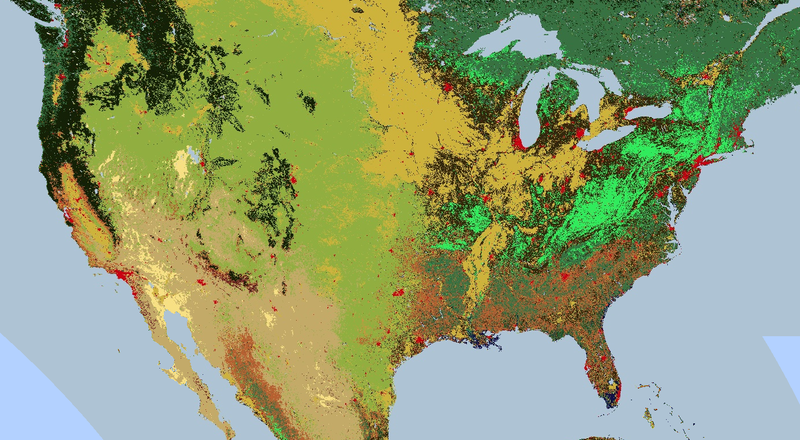 // Load 2012 MODIS land cover and select the IGBP classification. // Define a palette for the 18 distinct land cover classes. // Specify the min and max labels and the color palette matching the labels. The result of the previous example should look something like Figure 5. Figure 5. MODIS 2012 land cover using the IGBP classification. // Define an SLD style of discrete intervals to apply to the image. // Load SRTM Digital Elevation Model data. // Define an sld style color ramp to apply to the image. // Add the image to the map using both the color ramp and interval schemes. // Load a Landsat 8 raw image. // Define a RasterSymbolizer element with '_enhance_' for a placeholder. // Get SLDs with different enhancements. OGC SLD 1.0 and OGC SE 1.1 are supported. The XML document passed in can be complete, or just the RasterSymbolizer element and down. Bands may be selected by their Earth Engine names or index ('1', '2', ...). The Histogram and Normalize contrast stretch mechanisms are not supported for floating point imagery. Opacity is only taken into account when it is 0.0 (transparent). Non-zero opacity values are treated as completely opaque. The OverlapBehavior definition is currently ignored. The ShadedRelief mechanism is not currently supported. The ImageOutline mechanism is not currently supported. The Geometry element is ignored. The output image will have histogram_bandname metadata if histogram equalization or normalization is requested.